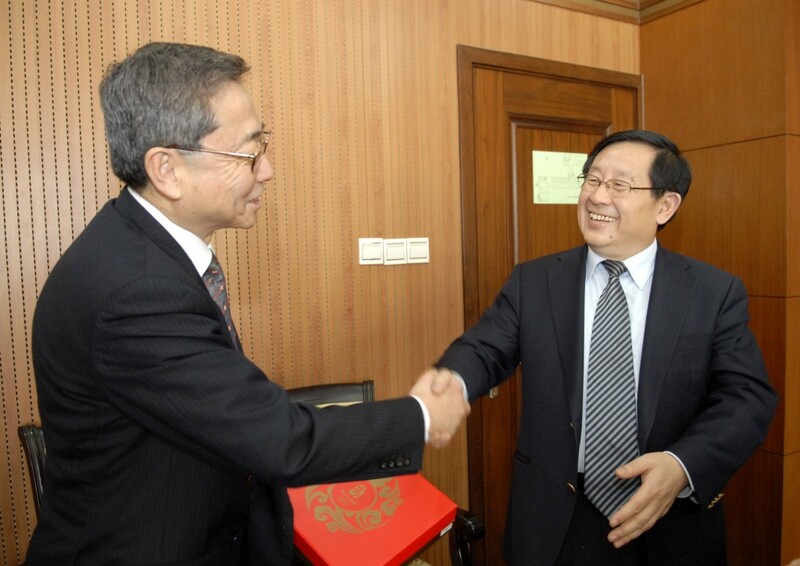 DG Ikeda meeting Dr. Wan Gang, Chinese Minister for Science and Technology. At the end of March/beginning of April, DG Ikeda visited both India and China, accompanied by senior IO staff from the two countries. In India he had talks with Dr Anil Kakodkhar, Chairman of India's Atomic Energy Commission and Prof Kaw, Chairman of STAC. In China, he met Minister Wan Gang and Vice-Minister Cheng in Beijing at the Ministry of Science and Technology. The purpose of these visits was to give updates on the IO's progress since the last Council meeting in November and to have discussions on various issues, including those related to the Design Review that will be raised at this week's STAC meeting and later at the second ITER Council that will be held in June in Japan. Whilst in Beijing, DG Ikeda also visited Peking University and the China Institute of Atomic Energy. At the CIAE he toured the materials laboratory, the Tandem Accelerator and the first Fast Breeder Experimental Reactor of China.